Although We have many approaches to find largest number among three numbers. In this article we will show you, How to write a Java program for largest of three numbers using Else If Statement, Nested If and Conditional Operator. First if condition check whether x is greater than y and x is greater than z. if the condition is True then x is greater than both y, z. First Else if condition check whether y is greater than x and y is greater than z. if this condition is True then y is greater than both x, z. Second Else if condition check whether z is greater than x and z is greater than y. if this condition is True then z is greater than both x, y. If all the above conditions fail, it means they are equal. This Java program helps the user to enter three different values and then it will find the largest number among that three numbers using Nested If in Java. First if condition check whether (x – y) is greater than 0 and (x – z) is greater than 0. If we subtract small number from big number then this condition fail, otherwise it will be True. If this condition is True then x is greater than both y, z. Else statement will execute when the first If condition is False so, there is no need to check for x value. In the Else statement we are inserting one more if condition (Nested IF) to check whether (y – z) is greater than 0. If this condition is True then y is greater than both x, z. Else z is greater than both x, y. We declared an integer variable called largest and we assigned this variable to the conditional operator functionality. First condition check whether x is greater than y and x is greater than z. If this condition is True then it will return first value after the ? symbol, which is variable x (x is greater than both y, z). If the first condition fail then it will execute the variable after the : symbol. By using Nested conditional operator we are checking one more condition here (y > z). If this condition is True then it will return first value after the ? symbol, which is variable y (y is greater than both x, z. If the Nested condition fails then it will execute the variable after the : symbol, which is variable z. It means z is greater than both x, y. 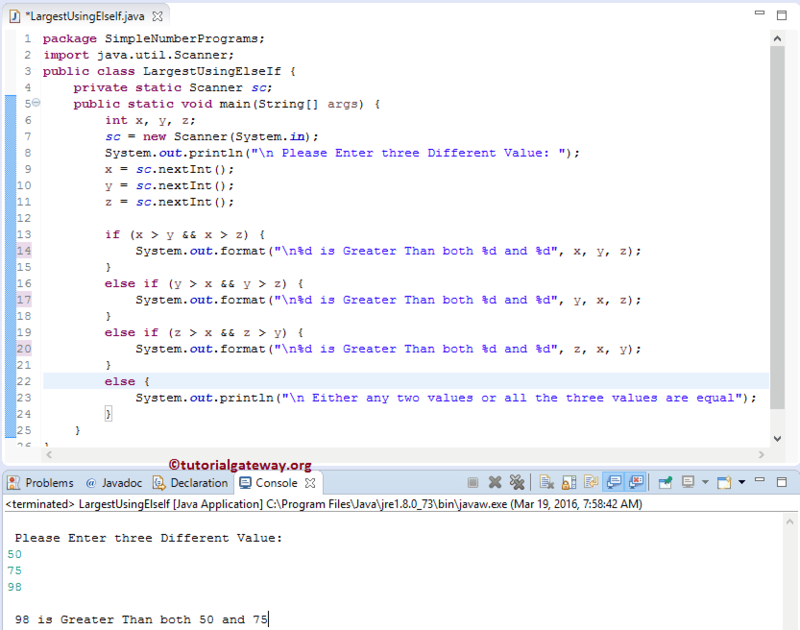 In this example, we are dividing the code using the Object Oriented Programming. To do this, First we will create a class which holds two methods to find largest of two numbers. First we declared a function LargestOfThree with zero arguments. Within the function, we used Nested If statement to find largest of three numbers. Within the function we used System.out.println statements to print the output as well. Next we declared an integer function LargestOfThreeNumbers with three arguments. We already explained the Logic in above example. Next, we are assigning the user entered values to the LargestNumber Class variables. Next, we are calling the LargestOfThree method. Note, this is the first method that we created with void keyword and this method will find largest of three numbers and print the output from the LargestNumber Class itself.